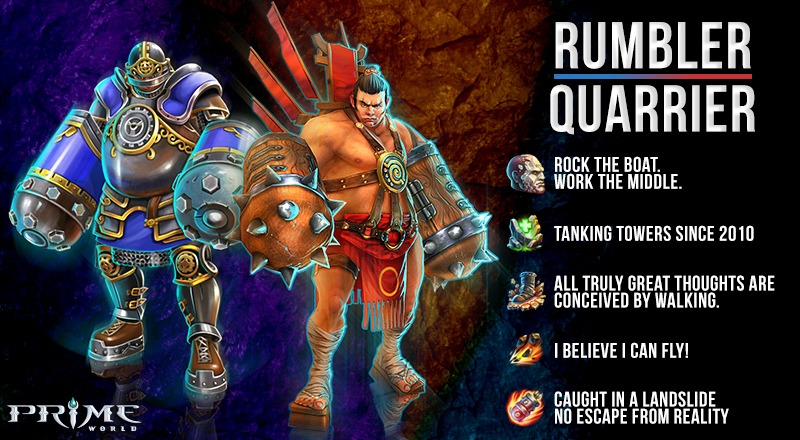 Our hero of the week is Rumbler/Quarrier! Like, share and comment on our Facebook Hero of the Week post for your chance to win 100 gold! Looking for more information on this hero? Look no further! The Rumbler never boasted of his strength. He quietly worked at the irrigation dam, turning the huge wheels to operate the gates. The water was mixed with Prime, which multiplied his strength, but the hero-to-be did not consider his power to be anything special. He would have probably lived out his days there, making a quiet, decent living, if he had not caught the eye of a famous martial artist. Admiring the power of the young worker, the Sensei invited him to try his hand at fighting some heavyweights. Initially the Rumbler lost often, but he liked the contests and trained hard, studying textbooks and manuals about wrestling. In the next tournament, he was undefeated, winning a dozen fights in a row. The Rumbler knew all the secrets of his art and thrice received the Master of Fighters award, which he proudly displayed. It was he whom Queen Isabel invited to an exhibition match with the Dokht champion in honor of Armistice Day. What rage the noble master felt when the opponent struck him down with a cheap shot in front of the ruler of the Keepers! From that day, the Rumbler has known no rest. In battle, he immediately charges into the thickest concentration of Imperium troops, looking for his adversary. Enemies stumble and fall as his charge shakes the earth and his fists deal crushing blows, but the Rumbler’s revenge is still incomplete: he has yet to find the scoundrel who robbed him of his title. He is, of course, a slowpoke, which is not surprising for a man of such size. When your every step shakes the earth, and a brush of your shoulder scatters men like bowling pins, it’s best to consider each movement you make slowly and carefully. No one knows the limits of the Quarrier’s strength. Even before the Call, the people were astonished at his incredible power. The behemoth thought nothing of war and heroism. He worked alone in an iron mine as a stone crusher, swinging a hammer which even powerful machines failed to lift. But one day, a landslide shook the tunnels. The mine’s roof supports cracked and splintered, and the ceiling threatened to cave in and crush the miners. The brave man held the rocks up with his back until the last miner had escaped unharmed. The miners had just enough time to see the depths of the mountain flash bright blue as the tunnel collapsed, burying the hero under its multi-ton rocks. But his death became his first rebirth. From Prime he emerged, a giant saturated with the power of rock. As if overcome with guilt, the mountains gave the hero not only strength and stamina, but also the invincibility of their granite boulders. His Catalyst was the crushed handle of his giant hammer, which he had gripped tightly even in death. The best blacksmiths competed for the right to forge gargantuan armor for the Quarrier, as well as deadly flails, used both to destroy hordes of enemies and to smash fortress walls to dust. Reduces the amount of damage the hero receives. The hero is invulnerable but loses his ability to move. The land around the hero gradually turns into Native Terrain. If the character is on Native Terrain when using Boulder, his Health is also restored. After the hero learns Living Stone, he can use Shockwave while Boulder is active. As the hero walks, the earth around him shakes, slowing his enemies down. After the hero learns Shaking Step, he can slow down his enemies even more. A heavy blow to the earth throws nearby enemies into the air and deals them damage. After the hero learns Resonance, Shockwave inflicts additional damage on slowed enemies. The hero hurls his weighted gloves in front of him, stunning his enemies for two seconds, knocking them back, and inflicting heavy damage. The hero himself charges in after the gloves. After the hero learns Deadly Landslide, enemies hit by his gloves will be slowed down, as well. Share your Rumbler/Quarrier builds and strategies in his discussion thread!